Poetry for Children: Good Karma; What’s the Weather Inside? 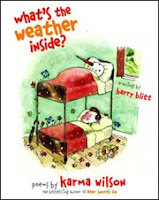 Karma Wilson is the author of some 28 picture books, featuring her recurring “Bear” and “Calico” (cat) characters, but she branches out with a new collection of some 100+ poems in the hilarious anthology, What’s the Weather Inside? With perfectly matched pen and ink drawings by New Yorker cartoonist Barry Blitt, and a “Postcard” font that suggests handwritten poems, this collection evokes Shel Silverstein in its look, sound, and feel. Wilson’s collection is big on humor, and kids are sure to love the rollicking rhymes that hit on many of their favorite topics such as pets, siblings, and school. (An index of titles and an index of first lines are also included, which is always nice.) She also plays with point of view, surprise endings, pairing poems, and my favorite, fairy tale and Mother Goose parodies. and make your own rope. Wilson, Karma. 2009. What's the Weather Inside? New York: Simon & Schuster, p. 116. Other “riffs” include “Miss Muffet’s Revenge,” “The Beast and the Beauty,” “Golden Eggs,” and “Mary Had an Appetite.” Kids will love creating their own parody of a favorite rhyme, tale, or song. Post theirs alongside a version of the original. And on Karma’s Web site, kids can “take a favorite poem and rewrite it sillier” and send it to Karma and possibly get it posted on her Web site. The poems in What’s the Weather Inside? also lend themselves beautifully to being read aloud. Start with one about teachers, “Red-Letter Day.” Then, invite students to join in on poems with repeated lines like “She’s my sister and I missed her” in “What I Missed” or “My parents want to sit down” from “Sit-Downs.” Even young children who can’t read independently yet (or children learning English as a new language) can join in on a repeated word or phrase while the adult leader reads the rest. FYI: This is one of several poetry books that Simon & Schuster is publishing this spring for which I wrote a downloadable Poetry Guide available online here. Scroll down halfway and you’ll find the “Poetry Guide” link. Check it out! Interesting! I know Karma's Bear books, but it'll be fun to see individual poems. Great guide, by the way. And you had so many fun and/or lovely books to work with! Thanks a bunch! And I agree-- that was a great crop. And reading them all at Christmas (to develop the guide) was heaps of fun!